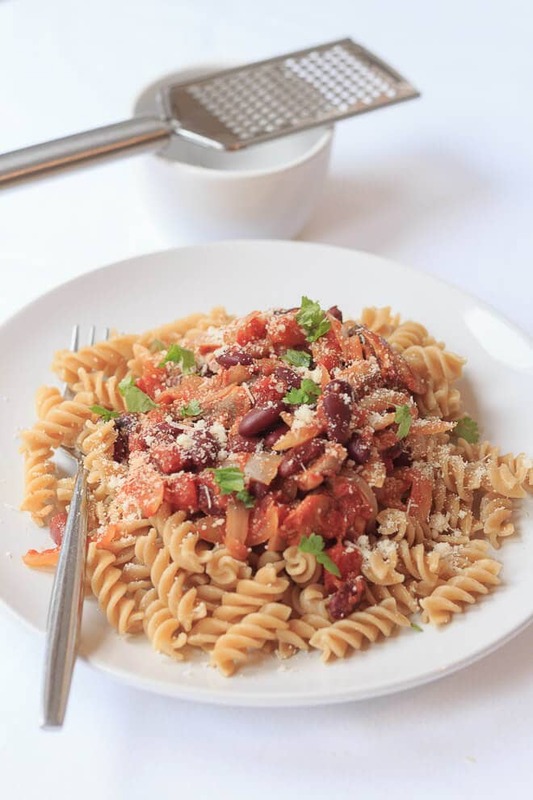 This chilli pasta is a quick and easy healthy family meal. Vegetarian, with kidney beans substituted for meat, it’s full of fibre and goodness. Plus it takes just under one hour to serve. Chilli Pasta, or Chili Pasta? Take your pick on what spelling you prefer, depending on where you are in the world! As I’m in Scotland (U.K) we’ll go for the Oxford Dictionary definition. For my U.S. chums, I know you’ll go for the later, but what’s spelling between friends anyway? And by the way a very Happy Thanksgiving to you all! 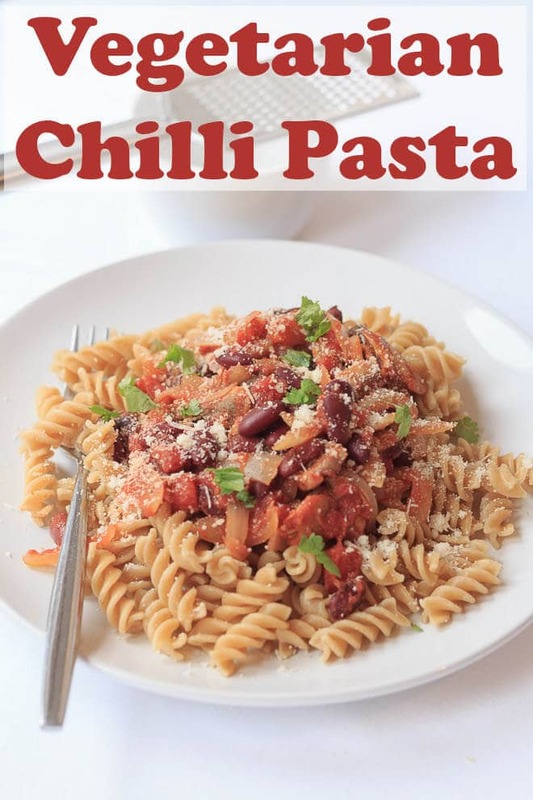 So, besides the spelling difference, I can assure you that there is no difference in just how tasty this chilli pasta dish is, wherever you are in the world! 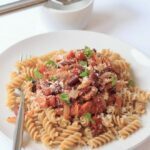 With all the nutritional goodness of the whole wheat fusilli and protein from the kidney beans, this low cost family meal for 4 is one to add to your “quick dinners” list. It’s great for those occasions you don’t have much time to prepare a meal but need something healthy. It’s perfect for freezing too. I feel there may be a flurry of such dishes like the chilli pasta to come as I tighten our belts and continue looking for new employment. I tag these meal options “low cost” so if you’re looking for more options like this, then click the tag at the bottom of the post to check them out! Healthy slow cooker turkey chilli is a delicious lightly spiced and easy version of the Mexican classic recipe. This tasty dish is one all the family will love! Easy vegan chilli is just that an all in one pot of delicious and easily made vegetables and beans. It’s packed full of vitamins and with this quick healthy meat free chilli alternative you’ll find you won’t be missing meat at all! Quorn chilli is a delicious alternative to beef chilli. I’ve made this tasty vegetarian family Quorn chilli recipe for many years now. This recipe is versatile in that you can also make it with beef if you’re a meat eater, or can’t get Quorn. To go with this chilli pasta recipe, I like to serve it with a tasty simple green side salad of lettuce and cucumber. This chilli pasta is a quick and healthy family meal. Vegetarian, and full of fibre and goodness, and it takes just under one hour to serve. Spray the bottom of a large saucepan about 5 times with the low fat cooking spray, heat the saucepan on a high heat until the oil bubbles, then turn the heat down slightly. Sauté the onion and garlic until soft. Add small amounts of hot water if they stick to the saucepan. Add the mushrooms and stir everything together until cooked. Add the red kidney beans with the chilli sauce and the can of chopped peeled tomatoes. Add the ground coriander and ground cumin and bring the mixture to the boil and allow to simmer for about 15 minutes. Meanwhile cook the fusilli as per the instructions on the packet. Season the chilli to taste. Once cooked drain the pasta and divide it equally amongst 4 plates. Top the pasta with the chilli. Garnish with the freshly chopped pasta and parmesan cheese. The chilli is great for freezing.